Samuel Oldknow’s Georgian Church replaced an older and much smaller wooden church. It was perched on Marple Ridge at the heart of a small isolated group of buildings set amongst pastures and lying beside the long-established route between Marple and Disley. Nowadays, we do not associate the area around the church as being ‘The Ridge’ but that is how the land between the Church and Hill Top Farm is designated on old maps. 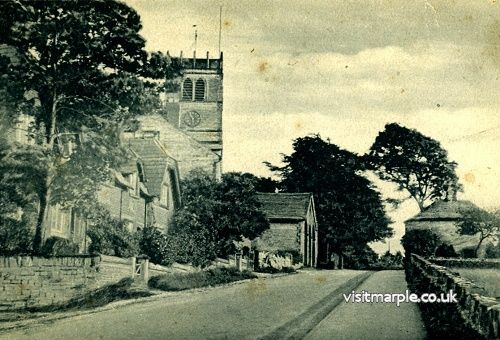 When the church was built, Oldknow had the Marple – Disley road relocated from the east side of the old timber framed church to the west of the new church. Church Cottage (later known as The Round House) was built almost opposite the entrance to the church. The painting and the early photograph show it clearly. I t is thought that Oldknow was responsible for its construction, possibly as a tollhouse. However, the road was never turnpiked although it did have a significant role in the local network of routes across the Pennines in the early 19th century. The painting and the photograph also show the Hearse House and the Coach House. As sexton, William would also have been responsible for these buildings. In 1841 William was living at Church Cottage with his wife Mary who was born in the hamlet of Whittle, now part of New Mills, and their 5 children aged between 1 and 12. Ten years later the family has moved to Road (sic) Houses Farm, Hawk Green and there were two more children. The census described William as a farmer of 11 acres. “To the memory of William Hyde, who having for the long period of forty two years faithfully discharged the duties of Parish Clerk and Sexton, departed this life November 12th 1865 aged 64 years. The Parishioners of Marple erected this tombstone”. The 1871 and 1881 census returns record that William’s son, Joseph and his wife Hannah stayed at Rhode Houses Farm and increased the farm land to 22 acres. However, by 1891 Joseph, a widower, was living alone in a cottage on Hibbert Lane and was described as a labourer. Church Cottage was demolished around 1930.